Albright IP have a team of experienced, qualified UK Trade Mark Attorneys. We represent both large and small clients before the United Kingdom Intellectual Property Office (UK IPO) and obtain comprehensive and cost-effective trade mark registration. Please see our video below for an explanation of the UK trade mark procedure. The UK is our home territory and we file and prosecute UK trade mark applications at the UK Intellectual Property Office (UK IPO). We want to understand your brand from an early stage, in order that we can build up a complete picture of your requirements. What steps are involved in the UK trade mark registration process? A trade mark application passes through various different stages on the way to grant. Please see the timeline below for an indication of the process involved. In a straightforward case, the UK Trade Mark Application procedure takes 4-6 months. Our approach is to make UK trademark registration simple, cost effective and accessible to all. You can contact us safe in the knowledge that fees will not be charged for enquiries and general advice. We file virtually all UK trade mark applications via the UK IPO’s e-filing system. This is a fast, efficient system and is less expensive than using the traditional paper filing system. 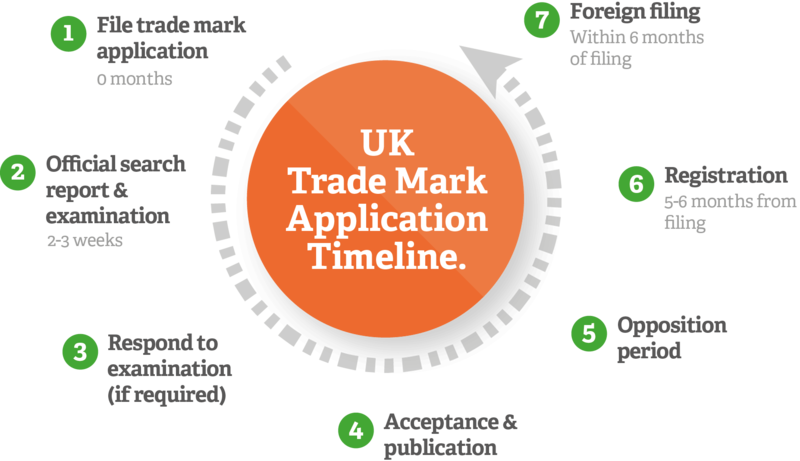 Please explore the following sections for further details of the UK trade mark application procedure. Prior to using or registering a new UK trade mark, searches should be carried out to check that your trade mark is free for use and registration. We will conduct a free trade mark search for IDENTICAL trade marks on the UK and European Union Trade Mark (EUTM) Registers. Please contact us with your trade mark and a list of goods and/or services of interest and we will do this free Trade Mark search for you. If this is clear, we advise how best to obtain trade mark registration, where you need it. For example, in the European Union via a European Union Trade Mark, or further afield using national Trade Mark Applications or the International Trade Mark system. If more detailed full clearance searches for confusingly similar trade marks are required, we offer a range of search packages and can advise upon the most appropriate package for you, along with costs. In addition to registered trade mark searches, Albright IP encourages you to undertake your own investigation into the use of “unregistered” trade marks, for example, on the Internet, Yellow Pages, at Companies House and on Social Media sites such as Facebook® and Twitter®. For more information, please contact us by calling +44 (0) 1242 691 801 to speak with one of our qualified UK and European attorneys. A list of the goods and/or services in relation to which the Trade mark is used or intended to be used. If the application claims priority from a corresponding foreign trade mark application, please provide the filing date, application number and country of first filing. An official filing receipt is issued by the UK IPO 4-6 days after filing. The filing receipt confirms the filing date, the trade mark and the goods and/or services applied for and allocates an application number. Absolute grounds - i.e. the Examiner makes an assessment of whether the trade mark applied for is descriptive, non-distinctive or customary in the relevant trade. The Examiner will also consider whether the mark is "contrary to public policy" (i.e. is it offensive) and if it includes any "specially protected emblems". The "specially protected emblems" include the Royal Crowns, Royal Arms, representations of the Royal family, coats of arms, national flags and the Olympic Symbols. Again, the Examiner will detail any such objections in his examination report. If examination objection is raised, the Examiner will set a period for the applicant to respond. If we are your Attorney of Record, we will consider the objections raised and advise upon the best way to respond. If you have filed the application yourself, we are happy to review the examination report for you and advise in the same way. the trade mark applied for contravenes copyright, design right or registered designs. The opposition rate against a UK trade mark application is quite low, presently about 5% of all applications published. If a third party is concerned, they will usually request to extend the opposition period by one month and try to resolve the situation amicably. In most cases, where there is practical distance, issues are resolved without the need for formal opposition. For example, via a limitation of the specification in the trade mark applied for or a co-existence agreement. If opposition is filed, Albright IP can advise how best to defend your application. After publication, if the application is accepted for registration, the Certificate of Registration will be issued by the UK IPO. This document confirms the registration details and includes a representation of the trade mark, the goods and services covered and also, the filing and registration dates. It is important to keep your registration certificate safe because it is not possible to request further copies of the original certificate. Once the UK trade mark application has registered you may use the ® symbol to indicate that your trade mark is now registered. This cannot be used until the trade mark is registered. You may also wish to state "[YOUR TRADE MARK] is a Registered UK Trade Mark of [PROPRIETOR]". This alerts others to your rights and can act as a deterrent to infringement. A UK trade mark registration can last forever, provided that it is renewed every 10 years and that it is used in the UK in relation to the goods or services for which it is registered. A UK trade mark registration can be subject to action for revocation for non-use, five years after registration. Albright IP will ensure that all renewal deadlines are diaried and will remind you when renewal is due, ensuring that you have the opportunity to maintain your rights. Through our qualified and experienced UK Trade Mark attorneys, Albright IP can fully and proactively protect your brand with registered trade mark rights, which can also be used to obtain lucrative licence and assignment deals. What do I need to do to maintain my trade mark? In addition to renewal of your trade mark registration, there are other steps that you can take to ensure your trade mark remains in force and well protected. Keep us informed of any changes to your contact details. If your contact details are incorrect then we cannot inform you of upcoming renewal deadlines or other issues surrounding your trade mark. For example, the UK IPO will notify us, as your representative, of any later filed trade mark applications that they consider to conflict with your rights. A UK trade mark registration may become vulnerable to revocation for non-use, if it is not used in the UK for a period of 5 or more years. Revocation is not automatic but an action can be brought by a third party, if they wish to remove your trade mark from the register and register their own trade mark. Faced with a revocation action, you would have to provide evidence of use of your trade mark in the relevant five year period. Compiling this evidence can be expensive and time-consuming. In order to reduce this cost, we recommend that you keep records to illustrate use of your trade mark. Include examples of advertising, features in magazines, use on the Internet, invoices showing the trade mark in use, business cards and brochures. It is important to use your trade mark correctly and in the format that it is registered. Trade marks should be used in the singular and as an adjective; never a noun or a verb. It is also wise to state that the trade mark is registered in the UK. Acceleration – it is possible to fast track the progress of your patent application before the UK IPO, for example, if you require a granted patent to determine a successful outcome in licensing negotiations. However, acceleration is at the discretion of the UK IPO and reasons in support of your request must be provided.